First timers might be wondering where exactly to start. There have been hundreds of kits released since 1980, if not thousands. Over the years the complexity and engineering has (generally) improved as Bandai's production technologies and design methods advance. While Gundams and other mobile suits vary in size over the course of the franchise most scale down to within an inch or two of each other. 1/144 scale kits are generally 5-6 inches tall, 1/100 range between 7 to 10 inches, and 1/60 scale comes in at about 12 inches tall. 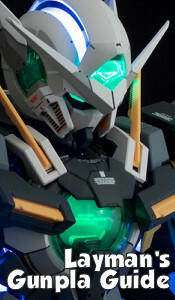 While not technically a stated grade, No Grade generally refers to 1/100 and 1/144 kits that haven't been released to the specifications of High or Master Grade. The cheapest of the kits, no grade models feature the simplest engineering and details. They often require a good amount of painting and touch ups to look their best. Within the last decade the quality of no grade kits has jumped tremendously and modern releases are on par with older High Grade kits. High Grade kits share the same scale as the original models some 30 years ago, 1/144. However size is the only element they share with their early predecessors. Today's High Grade kits often have generous amounts of detail but are molded in fewer colors than their big brothers. With some effort HG kits can look just as fantastic. Bandai has separate lines per HG universe. Kits from Universal Century are designated HGUC while HG Gundam SEED, HG Gundam 00, and HG Build Fighters come from their prospective series. Far more suits have received HG treatment over the years than any other category. Thanks to their small scale, ease of construction, inexpensive nature, and potential to look fantastic, HG kits are perfect for beginners. Real Grade kits are a newer line from Bandai, released following their 30th anniversary. They bridge the gap between High Grade and Master Grade while retaining the 1/144 scale. They're highly poseable, highly detailed, and come molded in all of the appropriate colors. Almost no painting is required for a fantastic looking kit. Unfortunately the complex designs often leave the kits feeling more fragile than other grades and that complexity makes them better suited for experienced builders. Master Grade are a step up in size and quality. At 1/100 scale they are often cast and engineered to look great without painting. Unlike HGs, most feature internal skeletons with large amounts of detail. They're also more expensive thanks in part to the additional gimmicks not found with their smaller brethren. For example, some kits have individual articulating fingers or the ability to transform. For the most part, skill requirements between HG and MG kits are rather minor. MG kits just take a bit more time and patience to build. For modelers not looking to paint, Master Grade kits are a great choice as more pieces are molded in their correct colour already. Over the years some kits have received second and third variation releases to take advantage of the improving technologies. v2.0 kits have been re-engineered from the ground up and are considerable improvements over their earlier counterparts. Many MG kits also have the additional title, "Ver. Ka," having been designed and stylized by Gundam designer Hajime Katoki. Perfect Grade kits are Bandai's top of the line kits. They're some of the largest, at 1/60 scale, and some of the most expensive. PGs take a lot of time and patience to put together featuring complex and highly detailed construction. The end result is a highly poseable kit with tons of detail. Internal detail is taken to a maximum and many PG kits come with gimmicks not seen on lower levels. PG kits also come with light up eyes and other components, a feature only starting to make its way into some MG releases. 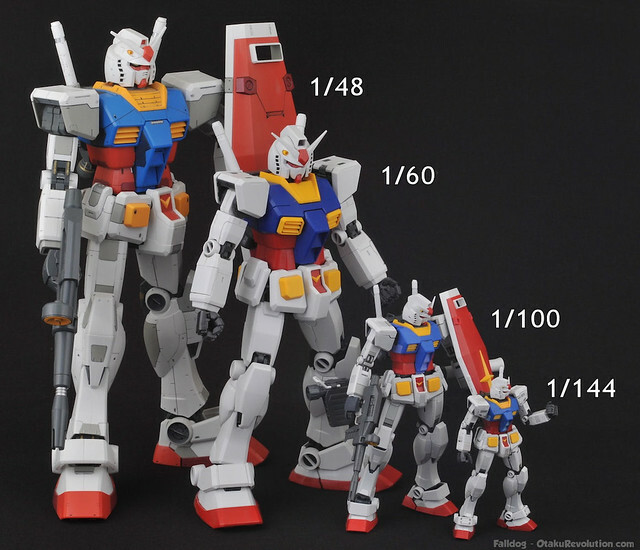 The Mega Size line was introduced in 2010 with the 1/48 scale RX-78-2. Since then Bandai has released six additional Mega Size models but none have gotten the same attention that the RX-78-2 received. The Mega Size kits are very easy to build, lack any internal detail, and are comparable to High Grade kits. This general simplicity is countered by their well detailed exterior and sturdy design. They're great for builders of any experience level who'd like a large show piece. SD Gundam kits are small, non-scale kits from nearly every series alongside many original designs. They're quick, easy to build, and mostly inexpensive. There's very little in the way of pose-ability or articulation as they generally consist of five or so main pieces. Since they're generally molded in two or three colours SD kits come with large stickers to help detail the kit. That's it for the main grades and sizes. Over the years Bandai has released kits in various other scales (such as 1/400 or 1/500) depending on the size of the unit itself. Bandai also has a tendency to re-release kits with extra finishes or clear armor pieces. Most popular are the chrome finishes which adorn popular kits from each grade. In addition to the previously listed Bandai released a few kits under the Hard Graph title. These kits are 1/35 in scale and are highly detailed, military model style models. Speed Grade kits are the cheapest of the cheap and 1/200 in scale. Bandai only made four. Several ships and larger mobile armors have been released as 1/400 and 1/550 scale models. Ships on a smaller scale have been released as part of the EX Model line (1/1600 and 1/1700) with smaller units at 1/144 and 1/100. If you're looking for more information on a kit itself check out Dalong.net, a Korean site with tons of pictures and reviews from nearly every released kit. For more information on all of the grades, visit http://en.wikipedia.org/wiki/Gunpla. Finding a local store which sells Gunpla is a relatively difficult process for folks in the US. 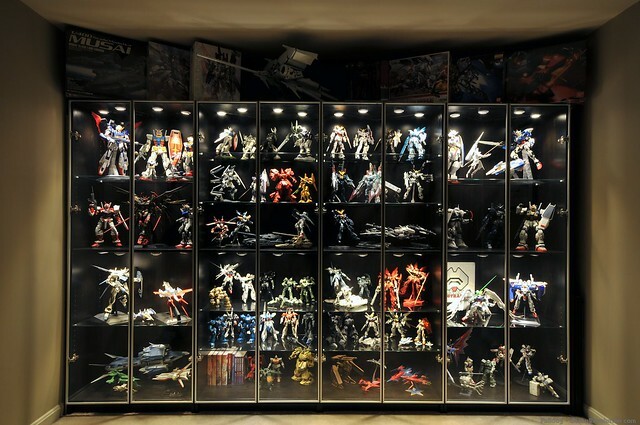 Despite its popularity, Gunpla is still a niche market compared to military and vehicle scale models, which have been waning in popularity over the past two decades. The only large scale chain store I know which carries Gunpla is Barns and Noble who've had select kits online and in a limited amount of stores. 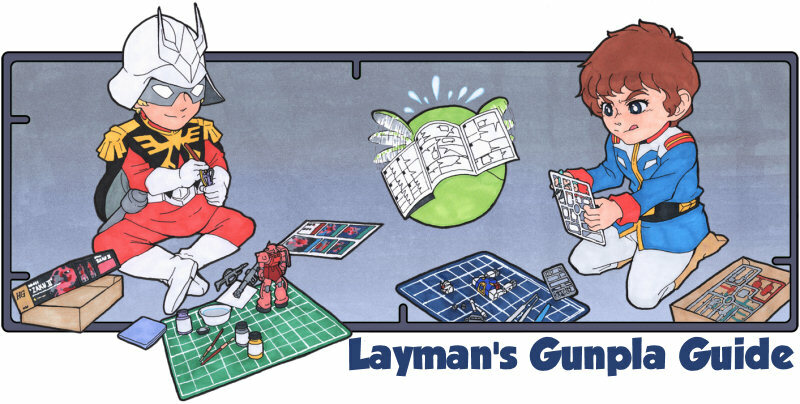 If you can find and browse Gunpla at local hobby store, please do so. It's a great way to promote Gundam and support your local shop, whom you'll likely be visiting again for paint and other supplies. Just be sure to price check because costs and markups can fluctuate quite a bit. Remember to factor in shipping and the convenience of getting it locally. Gunpla distributor, Bluefin Distribution, supplies retailers in the US though not all carry Gundams. You can use Bluefin's Dealer Locator to see if there are any potential shops near you. Those who don't have a local shop can always go online. There are many retailers online selling Gunpla from specialized stores to giants like Amazon. Online shops offer a great way to compare prices and find rare kits. Be sure to check out eBay for good deals and even harder to find kits. If you order a kit from Japan be prepared to make a choice, SAL or EMS (sometimes a proper shipping company like FedEx). SAL, "Surface Air Lifted," is your basic international shipping method. Compared to EMS it is incredibly slow, your package could arrive anywhere between two weeks and three months. Base SAL doesn't have any tracking information but some special versions of SAL do. Unfortunately this isn't very accurate and has more to do with delivery verification than tracking. SAL is also the slowest going through customs which is where packages spend most of the time sitting around. EMS is the fastest, and most expensive, shipping method. "Express Mail Service" is, as it says, express. It gets priority access to flight space and through customs. EMS also includes tracking so you can monitor the package's process.